An international symposium on organ donation and transplantation, with 70 international leaders in this field, was held in Doha, Qatar on April 12–14, 2013. The symposium received the endorsement of Her Highness, Sheikha Moza bint Nasser, Vice Chair of the Supreme Council of Health of Qatar. Convened by the Hamad Medical Corporation (HMC), the symposium celebrated not only the 5th Anniversary of the Declaration of Istanbul but also the implementation of the Doha Donation Accord. The Doha Donation Accord was established in September 2010 as the result of close collaboration between the Supreme Council of Health (SCH), HMC and the Declaration of Istanbul Custodian Group. The framework of the Accord was based on Qatari regulations, legislations, national norms and the principles of the Declaration of Istanbul on Organ Trafficking and Transplant Tourism. Well known are The Declaration of Istanbul principles built upon a universal declaration of human rights, and this Doha conference reflected the importance of the international collaboration and global consensus to improve donation and transplantation practices. 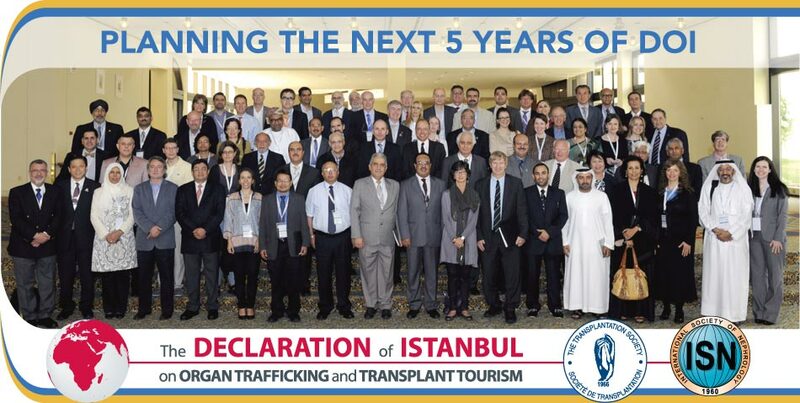 To re-affirm the Principles of the Declaration of Istanbul, which condemn transplant commercialism, organ trafficking, and transplant tourism, and to underline the urgency of putting the Principles into action in all settings where transplantation occurs. To urge all member states of the World Health Organization to adopt laws, regulations and practices consistent with World Health Assembly Resolution 63.22 and the Declaration of Istanbul, and in particular to enforce an end to transplant tourism and the use of executed prisoners as a source of organs for transplantation. To develop and disseminate descriptions of the technical and organizational features of sustainable programs and systems that can be implemented in different countries to promote national self-sufficiency in organ transplantation, as elaborated in the Madrid Resolution in 2010, especially through the development of deceased donation and equitable regional cooperative arrangements. To elaborate ethical approaches to acknowledging the generosity and humanity of donors and families in deceased organ donation programs. To develop, and recommend implementation of, systematic ways for physicians to identify and report to appropriate registries (in a quantifiable but non-judgmental manner) patients returning with a donor organ from an “unverifiable source” or manifesting other indications of a vended organ. To cooperate with organizations that are examining the common and overarching issues in the procurement and medical use of all products of human origin. To participate actively in the monitoring mechanisms of the Council of Europe Convention on Action against trafficking in human beings as it relates to human trafficking for organ removal (HTOR) and the Draft Convention against trafficking in human organs (THO). To develop means of communicating with and educating law enforcement authorities, as well as with human rights monitoring organizations, regarding HTOR and THO. To support adoption of a uniform coding system to improve traceability and vigilance for human organs. To assist the preparation and publication of a report.